With the Visuals Editor, you have multiple uniform “styles” to select from. Any performer at any point during a drill can wear any of the uniforms available. This means that you could have a traditional uniform for the winds and percussion, and a guard uniform for the color guard. *All changes in the Visuals Editor are based on the location of the Yellow and Red Anchors on the Count Track. Because of this, uniforms can be changed throughout the drill. There is no restriction on how many times a uniform can be changed; just be sure to have your anchors on the Count Track in the correct location where the change will occur! To select a uniform for use, highlight (select) performers on the field and open the Visuals Editor tool. If not already selected, select the Uniform & Equipment tab. At the top of the Uniform & Equipment tab will be two menus; one for Uniform Style and one for Hat Style. Select which uniform you would like under Uniform Style, and repeat the process for Hat Style. Once these changes are made, they will apply for the entirety of the drill, or until another change occurs. Carried instruments and equipment is easily assigned and changed for performers in a drill. To have performers carry an instrument or equipment, you must first select the performers on the field with a Selection tool. 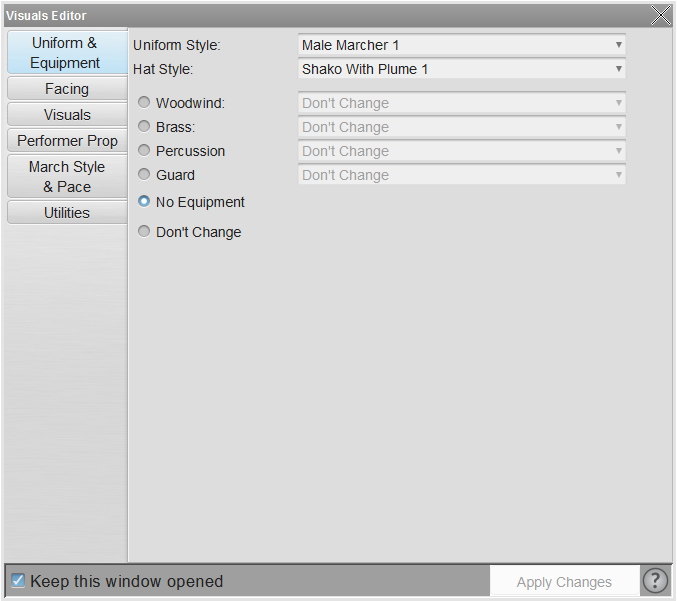 Once the performers are selected, open the Visuals Editor and click on the Uniform & Equipment tab. Select the radio button to enable the equipment “family” you wish to choose from. Once selected, the menu will be enabled, allowing you to pick the equipment of your choice. For example, if you selected trumpets on the field, you would choose the Brass radio button, then “Trumpet” from the Brass menu.